Reborn for the modular age, the Arturia MiniBrute 2 is a revolutionary new semi-modular analog synthesiser. Masses of features are all packed into this rugged aluminium-cased animal ready for you to unleash on the stage or in the studio. Easy to understand and very quick to master, you'll have total creative freedom. The MiniBrute 2 contains a 100% analog audio signal path featuring a VCO wave mixer and a classic Steiner-Parker multi-mode filter. These two features together help to create powerful analogue sound that's easily tweakable on-the-fly, making this a great synth for live performance. Also featured are other analog innovations such as the Metalizer, Ultrasaw and the unforgiving Brute Factor that provides unbeatable saturation and harmonics. A fully loaded 4-mode arpeggiator gives you 4-octave control, 6 time divisions and swing control. Plenty of sync options are available for the arpeggiator, including sync with an incoming MIDI clock source, great when performing with other instruments such as drum machines, or you could sync with the onboard LFO1 for great rhythmic effect. A full suite of connectivity is available on the back panel of the Minibrute 2, letting you use it in a huge assortment of situations. 5-pin MIDI I/O could be used to control other sound sources or you could use other keyboards to control the unit. USB I/O is great for connecting directly to your favourite DAW, giving you MIDI date over USB. You can also use this synth as a USB MIDI-to-CV converter with thanks to the full CV I/O. These controls can be used to manipulate pitch, gate, filters and amplitude. The 25 note semi-weighted is taken straight from the acclaimed Matrixbrute, full size keys support after-touch and there are also octave controls alongside pitch-bend and modulation wheels so you have complete control over expression adding real flare to your playing. 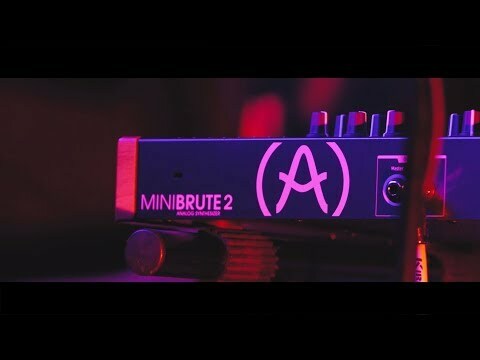 The MiniBrute 2 is right at home with both vintage synths as well as bleeding edge digital software synths, bridging the gap with it's own unequalled features.